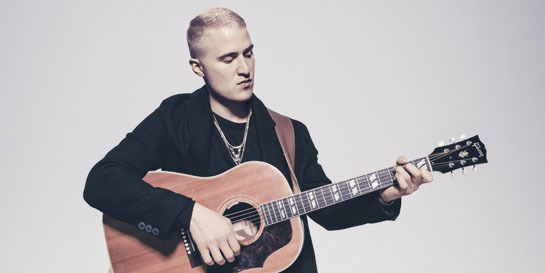 Island have this week announced the release of At Night, Alone, the second album from chart topping American singer, songwriter and producer Mike Posner, whose slow burning single I Took A Pill In Ibiza is set to top the UK chart for a second week. Released last summer, the track climbed steadily up the Top 100 with last week’s race to number one being hard fought, Mike pipping Lukas Graham to the post with a lead of just 261 sales. To date the track has been streamed nearly 20 million times in the UK. Ahead of its UK success, the track conquered Europe, landing four consecutive weeks at number one in Norway and going three times platium, number two on the airplay chart in the Netherlands and going four times platinum, top five on the airplay chart in Sweden and double platinum in Denmark. In the US, the track has been Top 10 on the iTunes charts, number one on the iTunes Dance chart and given Mike his first Top 10 hit on the Billboard Hot 100 in five years. Mike Posner released his debut album, 31 Minutes to Takeoff, in 2010. The album spun off three US hit singles including the double-platinum Cooler Than Me, Please Don't Go and Bow Chicka Wow Wow. Posner also wrote Maroon 5’s Grammy-nominated Sugar and Justin Bieber’s Boyfriend, as well as co-writing songs for Pharrell, Big Sean, 2 Chainz, Wiz Khalifa, Nelly, TI, Snoop Dogg, Avicii, Nick Jonas, and more. He is currently on British shores and took a trip to Radio 1 this week to perform I Took A Pill In Ibiza as well as a cover of Nick Jonas’ Jealous. Mike’s second album At Night, Alone is set for release on May 6 and includes features from Labrinth and Big Sean.